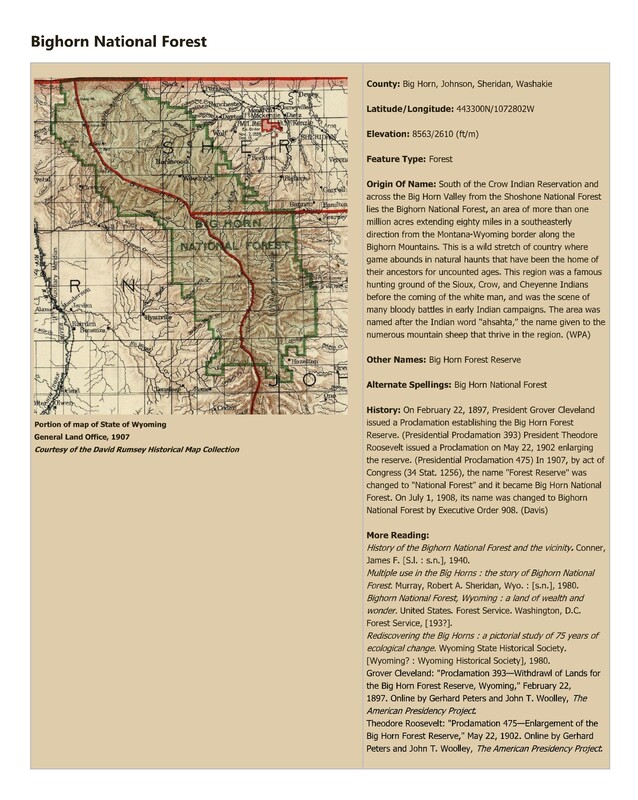 Topic: History of the Bighorn National Forest and the vicinity. Conner, James F. [S.l. : s.n. ], 1940.; Multiple use in the Big Horns : the story of Bighorn National Forest. Murray, Robert A. Sheridan, Wyo. : [s.n. ], 1980.; Bighorn National Forest, Wyoming : a land of wealth and wonder. United States. Forest Service. Washington, D.C. Forest Service, [193?]. ; Rediscovering the Big Horns : a pictorial study of 75 years of ecological change. Wyoming State Historical Society. [Wyoming? : Wyoming Historical Society], 1980.; Grover Cleveland: "Proclamation 393—Withdrawl of Lands for the Big Horn Forest Reserve, Wyoming," February 22, 1897. Online by Gerhard Peters and John T. Woolley, The American Presidency Project. ; Theodore Roosevelt: "Proclamation 475—Enlargement of the Big Horn Forest Reserve," May 22, 1902. Online by Gerhard Peters and John T. Woolley, The American Presidency Project.